Bahraini government forces clashed with protesters on Sunday at the funeral of a demonstrator killed by teargas at a previous rally. Violent crackdowns continue as the demonstrators protest against the royal family, ruling for more than 40 years. 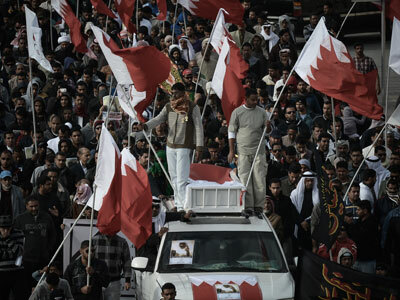 Scores of Bahrainis attended the funeral of the protestor Haj Habib Ibrahim Abdullah, which resulted in another demonstration against the ruling Al-Khalifa family’s regime. 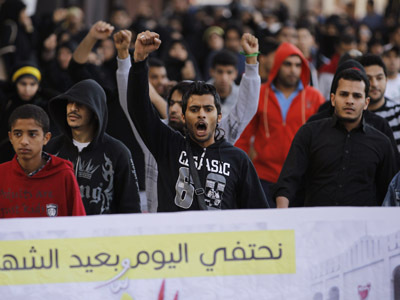 Protesters shouted slogans against the regime and called for release of jailed activists. 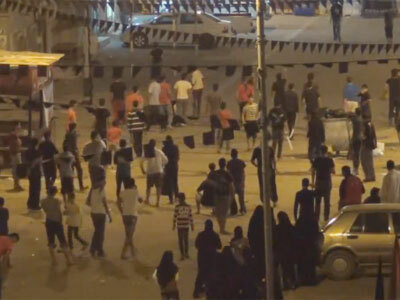 Government forces fired teargas and birdshot to disperse the crowd. A demonstration on Sunday was held at the funeral of Abdullah, who died after inhaling poisonous teargas. He and his grandson were exposed to lethal gas fired by government forces during a peaceful anti-regime demonstration last Monday. The nine-year-old grandson is now suffering from side effects and is being treated abroad, Ahlul Bayt News Agency reports. Abdullah and his grandson were exposed to gas during a previous peaceful demonstration which was held in Malkiya village last Monday aftertop Bahraini court overturned an appeal by 13 anti-regime activists on their sentences for protesting in 2011. Seven of the activists received life sentences, the other sentences ranged from five to 15 years in prison. 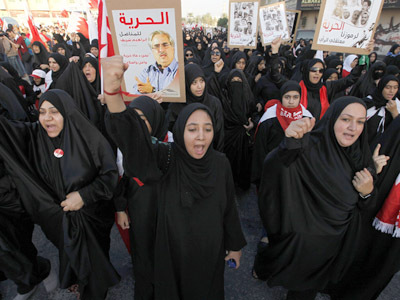 The 13 whose appeals were overturned were originally part of a group of 20 activists convicted by a military tribunal of conspiring against Bahrain’s Sunni royal family and “setting up terror groups to topple the regime.” They then lost an appeal in civilian court in September 2011. Seven chose not to appeal again. Asma Darwish from the European-Bahraini Organization for Human Rights told RT that Bahraini authorities are regularly using excessive volumes of “toxic gases” against citizens even inside peoples homes. She also claimed that the house of an 88-year-old man was targeted on several occasions, leading to his death. 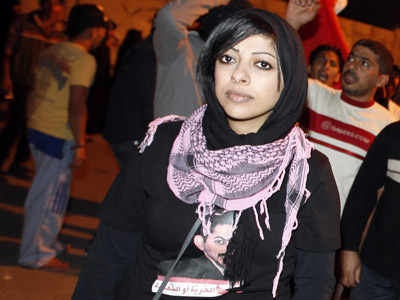 “We have been pointing to the amount of teargas being used in residential areas against peaceful protesters and we are very disappointed at the international community’s reaction, especially the US and the UK’s position towards the Bahraini revolution, being an ally and applying double standards when it comes to dealing with the situation in Bahrain,” she added. Thousands of Shiites protested against the jailing of 13 activists on charges of plotting to overthrow Bahrain’s monarchy on Saturday near Manama, witnesses said, AFP reports. The demonstrators shouted “we will not resign ourselves to it" and "we will not forget the prisoners”, while some carried photos of the convicted. The protest was held under close supervision of police forces. 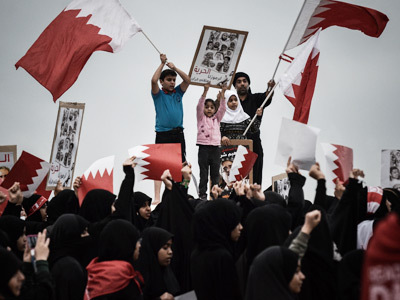 Anti-government protesters have been holding peaceful demonstrations across Bahrain since February 2011, calling for an end to the Al-Khalifa family rule which continues in the country since 1974. The protesters also stand for an end to the discrimination of the state’s Shiite majority by the predominant Sunni government. Eighty people have been killed and thousands arrested since the unrest began. Many opposition figures have been arrested on the allegation of planning to topple the government. According to a 2011 reports by Human Rights Watch, the government regularly abuses its citizens. The abusesinclude denying defendants the right to counsel and to present a defense, denial of medical access to protesters injured by security forces, torture and ill-treatment during interrogation.